My biggest takeaway from the trip was seeing how powerful and loving our God is. He demonstrates his love to others in many different ways, through poor pastors who are called to minister in the Aboriginal community without knowing exactly what their future holds, through Christian doctors who depend on charities for financial support yet still manage to impact their patients, to TAs and teachers who embark on a missions trip, a cultural exchange, to show love to students and faculty overseas. It’s so inspiring and touching to see the eyes of the children light up, when you offer to play with them or to hear their laughter as you chase or tickle them. Also, being able to visit nursing homes and sing to patients allowed us to interact with those from an older generation, and show God’s love to others, young and old. Visiting various Christian hospitals and seeing what they offer patients as a way to demonstrate God’s love in a tangible way, is an example to others from different cultures. God’s love is one that transcends all boundaries and barriers: cultural, language, and emotional. Olivia (far left) and some of her students (Wilang, Avril, and Kiki), having some fun with cameras. God was so gracious to have our team bond and unify as quickly as we did. Coming from all over the US, our team literally flew into Taipei, met the afternoon on which the camp would begin, and dove right into the camp. We all sort of just naturally clicked together as we hung out and played games and it was a joy to work with and befriend such amazing teammates. The Lord blessed our conversations and friendships with the students. Within the short five and a half days of camp that we had with our students, we became so close to our students, so much so that we snuck a few onto our trip around Taiwan with us in the second week of our trip, and so much so that a certain student who will not be named ditched his hospital volunteering job and took a train from Taidong all the way back to Taipei to see us as we prepared to go back to the US. Of the students that I got to befriend, I am most thankful for precious my small groupies (Allen, Thisway, David, Athena, and Alison) whom Amelia and I got to know really well through the course of the camp. The Lord gave us students who were very open to the Gospel and gave us many opportunities to share the Good News of Jesus Christ with them through Morning Manna, our impromptu Morning Bible Study, and conversations we had with students throughout the week. I really enjoyed Morning Manna not only as a chance to have God’s work in our lives shared with the students, but also because it allowed me to get to know my teammates better. It was also so cool to see Daniel and Olivia throw together that Bible Study on Thursday and Friday morning; I was encouraged by what they shared from Ephesians 2 as well as by the thoughtful and honest questions that the students asked in return. Most of all, I am so thankful for the opportunities I’ve had to talk and share with my students as well as their openness and patience with me to listen and respond. Ultimately, it is not we who bring others to salvation, but God. Please pray with us for these students who have become so precious to us, that they would be saved and that when Christ returns we will get to spend eternity in heaven with them! David and Amelia’s group, hiding behind a tree. On this two week trip, I had the privilege of meeting several medical professionals whose lives exemplified the statement above, showing me that it wasn’t just an idealistic cause – it was a reality that I must come to accept if I decide to walk down this same path. As a Christian who has been given the unique opportunity to pursue a medical education, I most certainly believe that I am called to make common cause with “losers” in my community and in my world. I find it is often the case, however, that my actions do not align with this belief – I like to win; I don’t want to fight on the losing side, to fight the long defeat. Listening to the testimonies of Dr. Cecilia Loh and Dr. Lai from from Heng Chun Christian Hospital, I felt a strange combination of admiration and distaste – admiration for their noble work and distaste because of the massive gap that I saw between the beliefs which formed the foundation of their stories and the beliefs which formed many of my current decisions. The Christian perspective of eternity is somewhat counterintuitive – as a human, I am naturally inclined to be nearsighted. Through this perspective, however, fighting on the losing side doesn’t necessarily mean accepting defeat or failure. I have come to see through this trip that the world is much more complex than I could ever imagine and that there are some tensions that I will need to embrace in order to do the right thing in my daily life. TAs and students at the harbor in Danshui (淡水) before a fun-filled evening! I was especially touched in Taitung by the story of the pastor who gave up so much and moved to the mountains to serve the Rukai children. As I watched his testimony, it was hard to believe that some of the misbehaving children I saw in the video were the same kids who now welcomed us so graciously into their lives. It was evident that God was using this man to do his work. Before we left, one of the children, a little girl, gave me a hug and told me in English, “I love you.” I was touched that our presence for a few short days could affect the children so much, and at that moment I knew I didn’t want to leave. I have never seriously considered serving the Asian community through medicine, but this trip has changed my mind. From our time at MacKay to the Christian hospitals we visited, and especially the children in Taitung — all these experiences make me long to return to Taiwan. 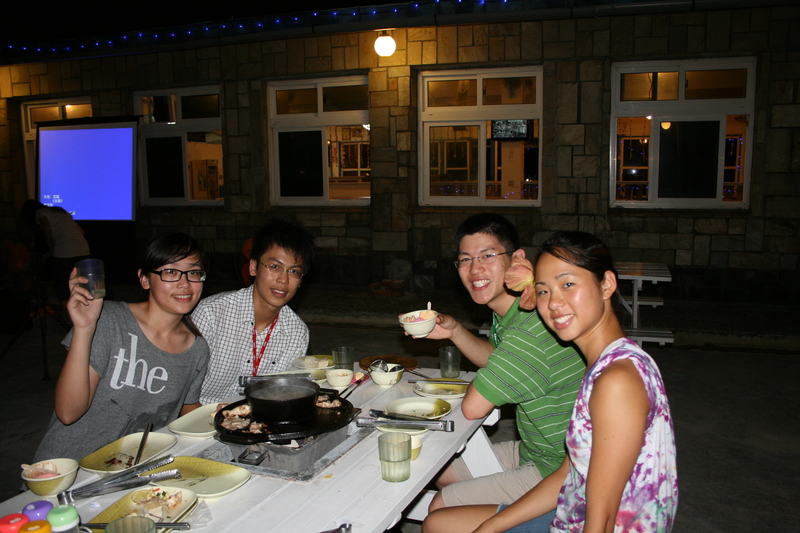 Kiki, Toby, Andrew, and Amelia at the welcome barbecue on the first night. I’m still amazed at how quickly relationships formed between the students and TAs on this trip. Even after participating in the National TsingHua University’s English camp for freshmen last summer (which was also a mission trip), it still took me by surprise how quickly I grew to love and care about my students. It’s such a blessing for me as well to be put in an environment where my main objective is to love with God’s love. It’s such a freeing feeling, getting to know people, loving them, spending time with them, all with the attitude “God loves them and wants me to show them that He loves them”. Why can’t we always live like that? Shouldn’t we always live like that? God really answered prayers by putting together a team that was diverse and yet cohesive. We all worked well together, and there was immediate trust, respect, and acceptance. He also provided ways to talk to our students, softening their hearts and ears to what we had to say. All of our prayer supporters truly were key players in how well this mission trip went. I’ve never been anywhere in Taiwan (in my memory) besides Taipei, KeeLong, and Hsinchu, so this trip was wonderful in that I got to travel everywhere! The tour was such a great opportunity, to go from the northeast tip, down and around to circle back up to Taipei. Kenting is a beautiful park, and even the unexpected 7.5 hour train ride up the eastern coast of the island was extremely scenic. Since we didn’t get to go to HuaLien this time due to weather, I’ve made it my goal to go there the next time I’m in Taiwan! So many people were a blessing on this trip, it’s almost impossible to sit down and think about all of them. God really does provide in every way. My roommate and I hit it off extremely quickly despite me thinking she was a boy upon our first meeting; my small group co-leader and I balanced each other out extremely well, and we got to be good friends as well as partners; a student in my small group, Allen, is a Christian and was so helpful in filling in gaps in my Christian Chinese vocabulary, as well as being a blessing to talk to and discuss the universe with; Cecilia and Li-Li Hsiao, two of our faculty, were such inspirational, strong, faithful female physicians who shared valuable insights, advice, and encouragement; another student in my small group, David, is not a Christian but showed so much interest and thirst for knowledge and the truth that in his quest he has reminded me how I should be burning with such a passion for my God. What will I remember most about MSCE? That God moves in ways we could never imagine or ask for because His plan is so much better and perfect than we could ever think to be possible. I will never forget the people-my students, my fellow TAs, the professors. I will always treasure my memories of our small group discussions, nightly fun activities, excursions around various Taiwanese night markets. I will always smile when I picture MSCE 2011. Professor Paul Cheng smiles with students (from left to right) Kiki, Wilang, Lirva, Avril, and Alex. The thing I remember most about the camp is the last night with our small group, playing games and singing silly songs on the roof, praise God for how much we were able to bond within a week! It was also a huge blessing during he tour to listen to the various doctors sharing their experiences of working at a Christian hospital and on the missions field. It sounds silly to say this now, but going into the trip I did not give God very much credit at all. What could possibly happen in the span of five days? We were all complete strangers, American and Taiwanese students alike. This is the inaugural year of the program and no one was quite sure what to expect. Add to that the language barrier and jetlag. My eyes were so fixed on our situation that I neglected to see that it was God pulling the strings. And God showed up powerfully. I was completely struck by how quickly we were able to form friendships despite language, culture, and fatigue. Our small group clicked and we were able to have meaningful conversations almost right off the bat. By the end of the trip, we were staying up as late as our bodies would allow just to spend a bit more time talking and enjoying our friendships. I have learned so much from all the students and I miss everyone very much. I can now look back on the entire experience and know that God is faithful and that He has a plan. Gene and Christina’s group has some fun on the day trip to Danshui. 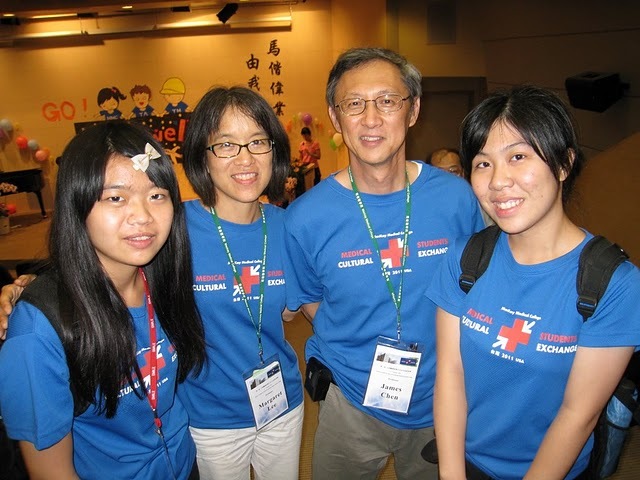 During our time in Taiwan, I had the privilege of meeting Dr. Loh, Dr. Chen, and many other physicians, all of whom have devoted their lives to the medical service of people in need both at home and abroad. As they shared their stories of hardship in serving in scarce living conditions, and the overwhelming shortage of doctors in underdeveloped countries, I was challenged, and even more so inspired, to think about the nature and extent of a physician’s global responsibilities. In our interactions throughout the camp, I was able to rediscover the dignity of medicine as a profession, and its potential to become so beautiful in the service of others. A major difficulty I experienced at first was the language barrier. Amongst a group of some fifty students and faculty members, only I could not speak Chinese. However, our language differences didn’t stop us. At the end of the first week, I had already forged deep friendships with several Taiwanese students, and together we shared many stories about our past struggles and blessings in life. The friendships I forged with them were some of deepest and strongest bonds I have ever had, and certainly ones that I will carry forward in my life-long journey. Although I went to teach, instead they have taught me the power of human relationship that can surpass all ethnic and language barriers. I was especially inspired by their humility, sincerity, and willingness to engage and listen despite our difficulties in understanding and our differences. Above all, I discovered the wonder of God’s work through people, and became closer with God in my relationship with Him. I am thankful and blessed to have been a part of this program, and I certainly look forwards to coming back next year. The team has a meeting to discuss progress of the camp and to share stories. Throughout the week of the cultural camp, I was challenged in many ways, but none more so than through the question of what I was going to do with my future. Although I was uniquely the participant who had no personal ties to the medical profession or field, I found myself fascinated with the lectures about the American healthcare system, with the problem-based learning session about kidney disease and medical ethics, and, especially, with the spirit and enthusiasm of all the Taiwanese medical students who have such bright futures. It was truly an inspiring environment to be immersed in. I was being drawn to the medical field for reasons completely removed from the tired American expectations of money and prestige; arguably, the doctors held up as paragons of the field were simply ordinary, modest missionaries who had to rely on the support of others in order to spend their lives pursuing a twofold goal that most people would call foolish. Just serving the poor is such a difficult task (I was making comparisons in my head after reading “Mountains Beyond Mountains,” the best-seller and Pulitzer winner about the life of Paul Farmer, a decidedly non-Christian “medical missionary” to Haiti, Peru, and Russia), but to combine that with the spiritual responsibility of spreading the good news? Utterly foolish! Impractical. A waste of time and skill; you’re better of getting rich first and then sending some money along each year around Christmastime, right? But, I don’t know; I think that’s what got my attention… What Gene Yoo described as “rediscovering the dignity of medicine as a profession” was, for me, more like a first-time glimpse in wide-eyed wonder at all the doors of opportunity thrown wide open to serve God pretty much anywhere. I mean, I’m quite sure that overseas missions is in my future somewhere, and as I enter my final year as an undergraduate, that “future somewhere” seems awfully close. But what if it’s God’s plan to send me as someone who can heal and save physically as well as spiritually? This could be some crazy idea, or it could actually be the long-awaited stirring of something honest from God that I should pursue. I will be thinking and praying about this more. 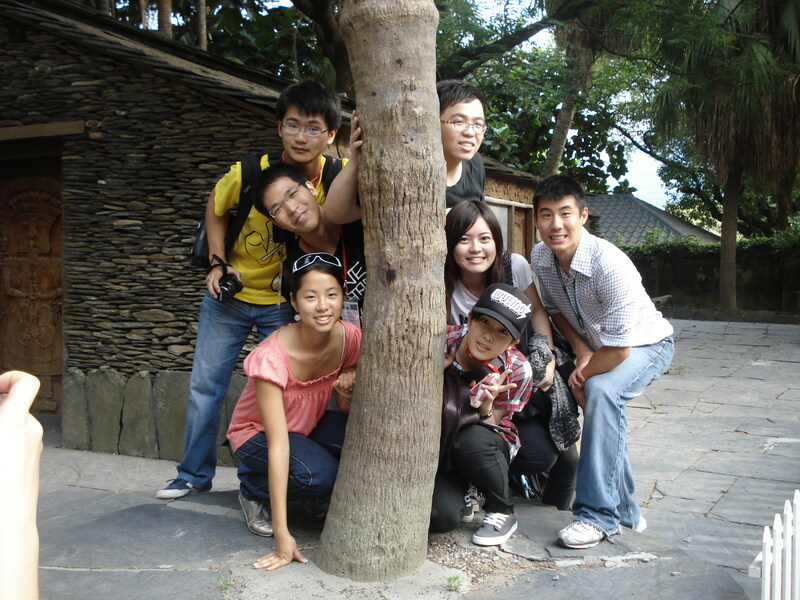 Needless to say, the MSCE summer camp has been greatly beneficial for all involved, from the faculty who thought they came to teach but learned so much more, to the Taiwanese students who thought they came to learn about American culture but experienced so much more, to the American students who thought they were engaging in a short-term summer project but ended up in a relationship that will last much, much longer. Professors Margaret and James Chen smile with two Mackay students, Wennie and Helen. I am not yet used to the fact that my own older daughter is almost a college student herself, and that it wasn’t a huge stretch to call these college students on our US team and at Mackay “my children.” What a blessing it was to meet the 12 students from the US in Taiwan earlier this month, and to see them live and give out the gospel message and love of Christ both at Mackay and on our island tour the week after. And though few in number, the Christian students (Tim, Holly, KiKi, Alex, and others) we met in Taiwan also deeply impressed me. The Lord does a wonderful work with each individual He calls to himself through Christ, and what a unity there is among his children, whatever their culture or age may be. We have indeed been blessed to pray and work together to bring more people from Taiwan into God’s kingdom. The members of MSCE 2011 in front of Mackay Medical College- a real community of new friends!